Watching The House With a Clock in its Walls is like being on a massive sugar high: It’s way too fast, very confusing, and eventually causes you as a viewer to crash and fight falling asleep. Why horror director Eli Roth and Supernatural creator Eric Kripke were chosen to helm this project is a mystery given that neither are known for family entertainment, and it really shows here. Add a completely miscast Jack Black, underused Cate Blanchett, and a child actor with little screen presence, and you have one of the dullest fantasies of the year, for adults anyway. The kids in my audience laughed a lot, so I’m sure this film will be a hit at 12-year-old slumber parties on dark stormy nights, if that’s any consolation. Following his parents’ death, Lewis (Owen Vaccaro, of the tedious Daddy’s Home franchise) is sent to live with his quirky and mysterious Uncle Jonathan (a thoroughly annoying and out-of-place Jack Black) in his creepy old mansion. Jonathan basically shirks his responsibilities as a guardian, except for one rule: Don’t open the ominous cabinet in the house’s center, or bad things will come. Oooooo. As always in these creepy haunted location movies, Lewis hears a ticking sound in the wall one night, only to see Jonathan sneaking around like a cat-burglar. After discussing this with a kid at school, Lewis confronts Jonathan, and the man reveals himself and deadpan neighbor Florence Zimmerman (Cate Blanchett trying her hardest to save the picture) are a warlock and witch, respectively. They start training Lewis in magic as he tries to investigate the secret behind the ticking in the wall, which leads to yet another fantasy bad guy with a take-over-the-world scheme (Played with a modicum of energy by 90’s icon Kyle MacLachlan). The House With a Clock in its Walls has absolutely no idea what it is or who it’s aimed at. Black is in full man-child mode here, making funny faces to make kids laugh, but a blasé story, lack of momentum, and later scary images make it questionable for younger kids. 12-and-ups should be safe, but any younger may have nightmares. Again, the kids in my screening laughed a ton, and I probably would have liked this too in my younger years, but I feel the pain of their parents who must pay for them to see it and watch good actors like Black and Blanchett act like one-dimensional cartoons. Director Roth is expectedly more comfortable in the horror scenes than the comedic ones, but I found much of the humor flat. At least I earned a free popcorn the next time I go to the theater and heard a comparably interesting podcast about the proper temperature of wine on the ride back home. 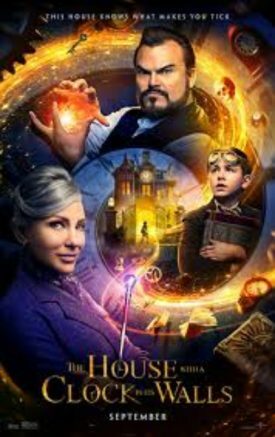 The House With a Clock in Its Walls is a boring, drawn-out fantasy with mostly uninteresting direction, a rushed script, and unlikable characters that had me in an epic battle to avoid sleeping in my comfy seat. As with The Nun, I must ask why this isn’t an October release. Its creepy visuals and tone are tailor-made for tweens on a stormy night, but adults will likely be bored by this. At one point, a character says to young Lewis, “It’s a total waste of time”. I couldn’t agree more, young sir. Skip it.